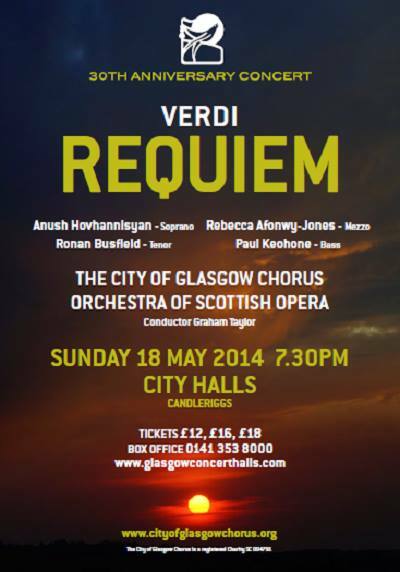 The City of Glasgow Chorus are singing the Verdi Requiem in Glasgow City Hall this weekend, on Sunday at 7.30pm. You may remember that when we last sang this, in Opole, I nearly had a cardiac event what with the drum, and then I fell in love and cried all over everything. We are being joined by our Polish maestro, Bartosz Zurakowski, who will be conducting. For the last eight days I’ve been laid low with the plague that has been going around. For a given value of laid low that means doing a ward round interspersed with coughing fits, anyway, but I went to rehearsal on Tuesday night and stayed very quiet and listened to Verdi from the middle of it, and I’ve been kind enough to my voice that I’m starting to think I’ll be good to sing on Sunday night. I might not have any vocal cords left at the end of it, but that’s a problem for Monday. This is going to be amazing. If you wish to join us for all this amazingness, tickets are still available through the City Halls box office. Oh, thanks for posting the poster — looks fab, and now I’ll have to sit down on Sunday and listen to Verdi at home. Miss you guys — break a leg!